The CIS is now without a CEO after the organization announced the departure of Pierre Lafontaine late Monday. There is no official reason for his departure. However, Neate Sager at Yahoo's Eh Game has the scoop. [S]ources state that Lafontaine has been bought out, with his resignation taking effect immediately. That decision by CIS was finalized after a conference call on Jan. 14, where the other issue was expanded interlock play in football. Lafontaine only joined the CIS on Jan. 31, 2013. In the press release, the CIS pointed to the league's new strategic plan and governance structure as the major accomplishments from Lafontaine's tenure. 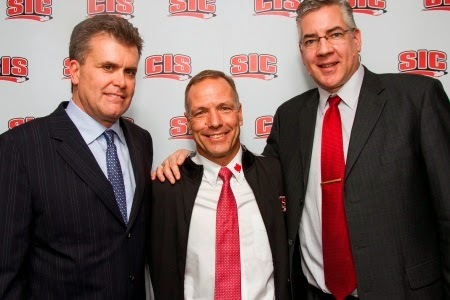 The former Swimming Canada exec pointed to the Sportsnet broadcast partnership as a key achievement from his time with the CIS. Now, the CIS has to find another person to fill the leadership gap. The search will begin immediately. The timing of the announcement should raise eyebrows. It's the middle of the CIS season and the league is gearing up for "Super Championship Weekend" in March. That weekend combines the CIS championships for women's/men's basketball and hockey. It represents the best television opportunity the league has outside of the Vanier Cup. We'll keep you posted as more information becomes available. Until then, fire up your conspiracy theories. I'm sorry, someone has to say it: something doesn't smell right.